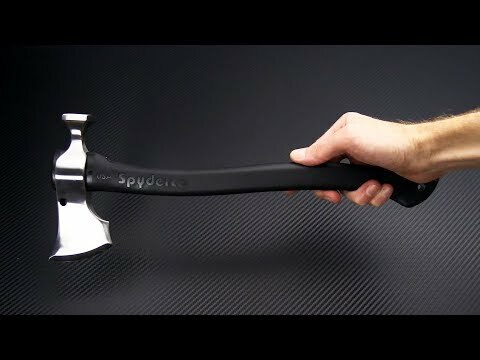 Spyderco, working with German outdoor enthusiast Martin Genzow, delivers a well designed utility tomahawk in the Genzow HatchetHawk. The HatchetHawk combines the best features of a Frankish axe, bearded axe and tomahawk with modern, performance oriented materials. A zippered nylon pouch is included for storage and transportation. Brand new, direct from Spyderco Inc. The Genzow HatchetHawk has a head of tough, drop forged 5160 tool steel fit to an injection-molded polypropylene handle with an aluminum core for maximum strength. The handle is engineered for optimal energy transfer and control in use. The head has a hammer pole for added utility for outdoor tasks while the bearded bit extends the cutting edge for enhanced performance in both chopping and detailed cutting tasks. Carries via thick leather sheath with belt loop and large grommets for baldric-style carry.